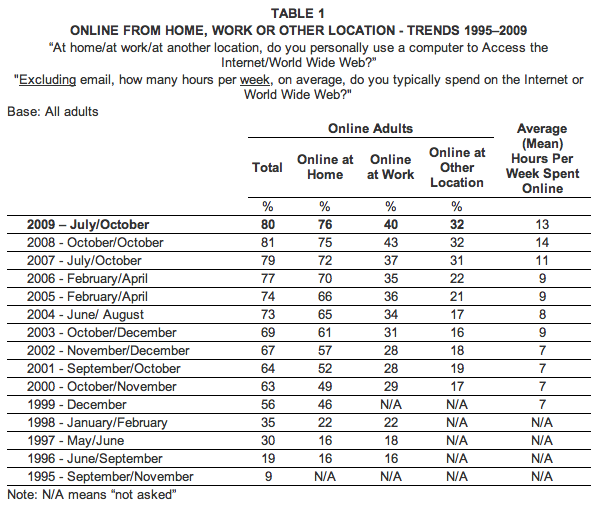 Harris Poll has released some interesting numbers on the daily usage patterns of Internet users. The survey which was conducted through telephone interviews with respondents reveal that the number of hours spent online by adult Internet now totals to 13 hours on a weekly basis. The survey was conducted by Harris Interactive between July 7 and 12 and October 13 and 18. It’s interesting to note that over the years, the average hours spent online by Internet users have increased consistently. From 1999 to 2002 it was only 7 hours. This increased to 8 to 9 hours in 2003-2005 then to 11 hours in 2007 before reaching 14 hours in 2008. While this year’s 13 hours is less than the number of hours spent online in 2008, it is quite understandable since more people resort to going online due to the economic recession and the start of the U.S. election campaign. And now that the economy has gone back to its feet, Americans are gradually shifting from doing things online to going back to their daily chores in the offline world. Half (50%) of all those online bought something on the Internet in the last month. This includes 62% of those aged 30-39 and 56% of those aged 40-49. The number of adults online, now 184 million (80%), has not changed significantly since 2008 and 2007. This includes those online at work, at home, at school or any other locations. However, the number of adults who are online at home has increased to 76% this year, and 75% last year, compared to 70% in 2006, and 66% in 2005. And possible reasons for all these findings? Perhaps the growing ability to use the Internet is growing, more sites and applications available for use, increase in TV watching online as well as increase in purchasing. So, are you spending more hours online now than last year? Have you been doing more online purchases now than before? Share us your comments.